Meet CJ. Yes, CJ stands for change jar and yes, I named it. I was given this handy change-saver for Christmas last year and I have to say its one of the best investments I’ve ever (not actually) made! (gift) It provides such an easy and fun way to save all that spare change floating around. I wasn’t sure how long it would take to fill or how much money that would be, but I am excited to say that it now holds over $150! I am looking forward to cashing it in for something special soon and highly recommend CJ as a way to organize and save. Designate a place for your change. It doesn’t have to be a fancy counting jar like CJ. Any old jar or bowl or bucket will do. Create a goal and/or reward. If you know that you are saving your pennies for a night out, a massage or a $100 shopping trip, you are simply more likely to save the coins. Use Cash. Obviously, the more you use cash instead of cards, the more change there will be. It is also a great way to budget and limit overspending. Round it Up. Loose change manages to find its way everywhere, from pockets and purses to washing machines, car consoles and counter tops. If you see it, touch it or hear it, gather it up and put it in its designated place. The occasional floor cleaning cushion turning change hunt can be a fun activity as well. p.s. If you are interested in this specific product, find it here on Amazon. 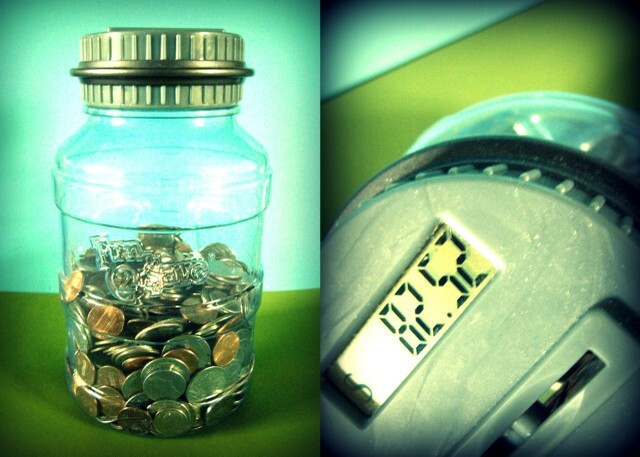 There are lots of other counting change jar options out there as well. Posted on November 14, 2012, in finances, organize. Bookmark the permalink. Leave a comment.